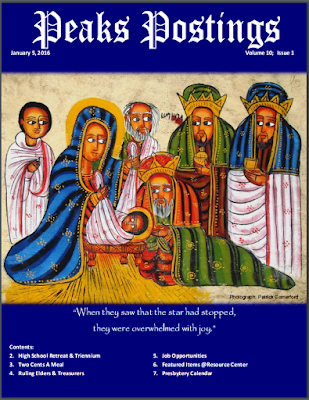 My photograph of an Ethiopian icon of the Visit of the Magi is being used this week to illustrate the cover of a Presbyterian church magazine in Virginia. Peaks Postings is the magazine of the Presbytery of the Peaks. My photograph appears on the front cover of Peaks Postings vol 10, issue 1, which is published today [5 January 2016], edited by the Revd Jeff Binder. The Presbytery of the Peaks, located from the Blue Ridge Mountains to Southside Virginia, has 124 Presbyterian congregations with over 15,000 members sharing in ministry and mission. The Presbytery of the Peaks includes 129 churches, spanning parts of Central Virginia, Southside, the New River Valley, and Allegheny Highlands. The antecedent presbyteries had their origin in some cases as far back as the 18th century. The Presbytery of the Peaks was formed in 1989 following the reunion of the Presbyterian Church, US, and the United Presbyterian Church, USA, in 1983. In whole or in part, congregations from Southern Virginia Presbytery (UPCUSA), Fincastle Presbytery (PCUS) and Blue Ridge Presbytery (PCUS) came together 121 years after the division arising from the American Civil War. Each of these presbyteries came into this union with its own rich history of mission. The oldest congregation, Old Concord Presbyterian Church in Spout Spring, was founded in 1735. The most recent congregation, Forest Presbyterian Church in Forest, was planted in 1998 in the burgeoning suburbs west of Lynchburg. His congregations did much to bring education and economic development to the Buffalo Mountain area of Floyd County, Virginia. And three of these ‘Rock Churches’ continue to carry out ministry along the crest of the Blue Ridge. The presbytery’s work in international mission in Haiti and Central America – involving annual study and travel exchanges, sister church relationships, and mutual sharing of gifts – has enriched the life of many of the congregations over the last 25 years. Some 100 of Peak’s 133 congregations have fewer than 100 members, while large city congregations are based in Roanoke, Lynchburg, Martinsville, and Danville. As the Presbytery faces the challenges of the new century, it declares its mission is to enhance, equip and empower congregations and leaders to become bold servants of transformation for the glory of the Triune God. I am continuing my Christmas reflections, listening to the works of the great English composer Ralph Vaughan Williams (1872-1958). 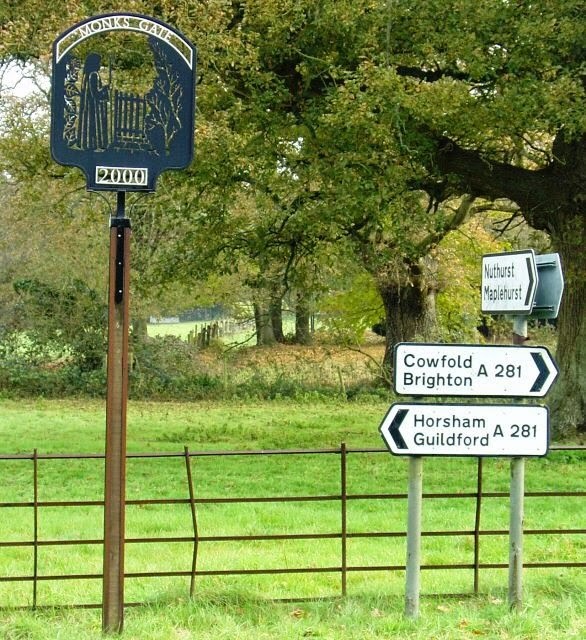 This morning [5 January 2016], I am listening to ‘The Sussex Carol’ (‘On Christmas Night’) which is included in The First Nowell (1958), a Nativity play for soloists, chorus, and small orchestra by Vaughan Williams. 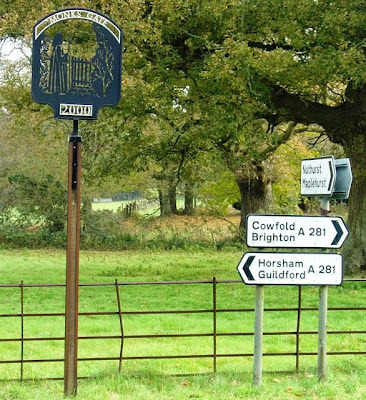 The First Nowell was first performed on 19 December 1958, four months after the death of Vaughan Williams, and includes a version of ‘The Sussex Carol’ (‘On Christmas Night’), along with a number of other well-known Vaughan Williams works, including ‘The Salutation Carol,’ ‘The Cherry Tree Carol,’ and ‘The First Nowell,’ which is the final, closing movement. ‘The Sussex Carol,’ which is sometimes referred to by its first line, “On Christmas night all Christians sing,” is sometimes confused with ‘The Wexford Carol.’ Last Christmas, we sang ‘The Sussex Carol’ as the Post-Communion hymn at the Cathedral Eucharist in Christ Church Cathedral, Dublin, on the Sunday morning after Christmas [28 December 2014]. It is said the words of this carol were first published by Bishop Luke Wadding of Ferns in A Small Garland of Pious and Godly Songs (1684). However, it is not clear whether he wrote the song or that he was recording an earlier composition. ‘The Sussex Carol’ often features in the Festival of Nine Lessons and Carols in the Chapel of the King’s College, Cambridge, and a version of it also appears in the Irish Church Hymnal (5th edition, 2004) as Hymn No 176. Edward Darling and Donald Davison, in their Companion to Church Hymnal, say the words are from a traditional English source, that they were adapted by Luke Wadding, and that they were reintroduced to English use through later editions of Luke Wadding’s carols, published in London in the early 18th century, subsequently undergoing considerable modification. The tune to which it is generally sung today is the one published by Vaughan Williams in 1919. Several years earlier, he included the carol in his Fantasia on Christmas Carols, first performed at the Three Carols Festival in Hereford Cathedral in 1912. Tomorrow: Four Christmas songs for Epiphany.